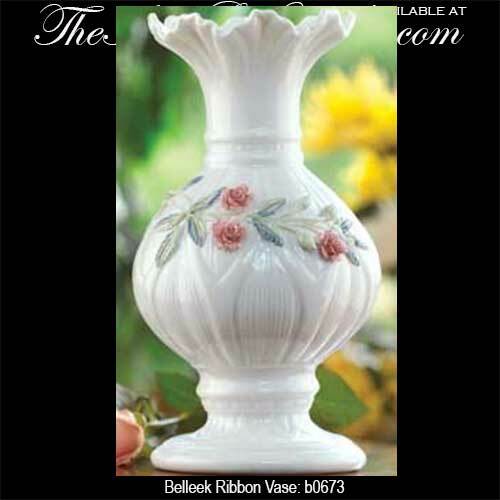 The ribbon vase is a flowered china design from Belleek. This Belleek vase was first shown in the 1928 Belleek sales catalogue where the retail price was set at 18 shillings! It got its name from an embossed ribbon pattern around the neck of the vase, and it became one of the most popular flowered pieces ever made by Belleek. In 1987 the ribbon vase was retired, but it makes a welcome return as part of the 2009 archive collection. The Belleek ribbon vase is a flowered sculpture with individually applied petals along with an embossed design around the neck. The Belleek vase measures 8" tall and it is limited to 500 pieces. The vase is handmade and hand painted in Belleek, Ireland and it is received gift boxed from The Irish Gift House.